beauty and the brick: Look, a car! 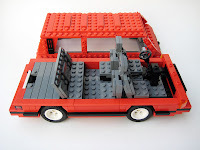 As a kid I built nothing but cars with Lego. Well, except when I played space. Or castle. Or pirates... Anyway, I built a lot of cars, trucks and the like. I was a boy after all. And although I fancy more imaginative creations today I still take pleasure in building something that goes wrooom! once in a while. 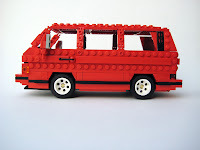 In his comment to the first post of this blog my dad said something about a T3 Bulli. 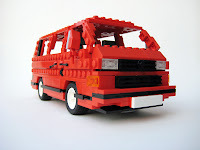 A Bulli is what the Volkswagen Van is called by it's german fans, T3 referring to the third model from 1979-1992 – the car my dad happens to own. To be precise, he owns one of the 2500 "Limited Last Edition" Multivan models from 1992. 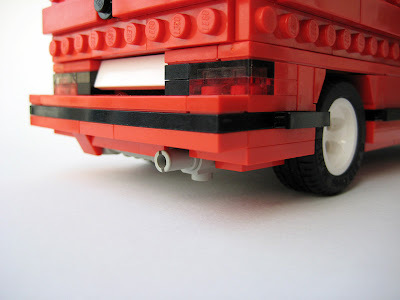 It's red and it's blocky – I knew what to do. So here is the result. Last Volkswagen to be rear-engined by the way. The round thing up front covers the spare wheel. It was quite a fun build. The detachable upper part wasn't intended at first, but with all the SNOTing (?) going on it sort of happened by accident. Lots of pics on Brickshelf. 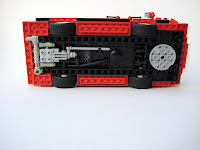 Hello friend amazing and very interesting blog about Look, a car! I really enjoyed reading this blog and I would like to have any update about it, thanks for sharing!! welcome to beauty and the brick. Two guys in their late twenties recently discovered their LEGO® collections again. This is what happened. Have fun!